Once again the right is coming out with the same tired arguments, claiming that guns have nothing to do with gun violence, that mental illness is the culprit. This argument is facile and demonstrably wrong. I can show you why in four charts. Economic inequality has a remarkably strong relationship with mental illness–if mental illness were the cause of our gun problem, this would suggest that one of the best ways to combat the problem would be to reduce economic inequality. That’s a very left wing move. The right’s argument implies that we should all be supporting Bernie Sanders. The United Kingdom has the second highest rate of mental illness in the world. 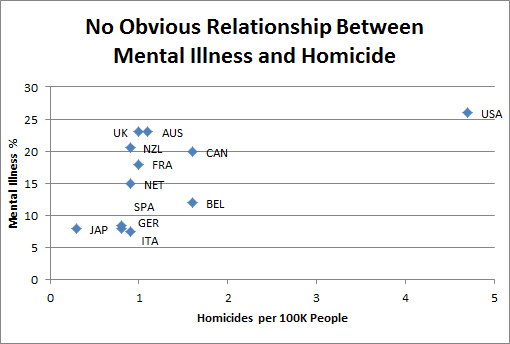 Many countries have similar homicide rates despite completely different rates of mental illness. The US is just a couple of points less healthy than the UK or Australia, but it has a crazy high homicide rate. Belgium is much healthier than most countries, but its homicide rate is high by European standards. Italy has one of the lowest rates of mental illness around, but its homicide rate is nearly the same as New Zealand’s, which has one of the highest rates of mental illness. It’s time for conservatives to face facts–mental illness is not the core cause of gun violence or homicide–gun ownership is. And if this analysis is wrong, if mental illness somehow really is the cause? Then the research suggests that a big part of the problem must be economic inequality–which means they ought to vote for Sanders. It’s a no-win situation for conservatives. There’s another voice in unison with yours — Henry Giroux. Very convincing analysis. Unfortunately your countrymen are not listening. Sometimes it is worth opening your mind – obviously not Jeb Bush’s – and say – Hey| maybe this bit of the constitution, drafted in the eighteenth century, does not make sense today. The right to bear arms was for self protection. It was not to enable the insane to go out and engage in a mass cull of citizens going about their lawful day. Yes stuff happens but it is the duty of a state (Federal level) to take action to minimise this kind of ‘stuff’. With around 450 gun incidents involving 4 or more deaths or injuries this year, it has become a human rights issue. no, not “the insane”. that’s the point. statistically, the sane are far scarier. Why do they always blame the mentally ill, like we want to shoot people. If I want to kill myself with a gun, I would only kill myself and nobody else. 26 May 2002 – A Vietnamese man walked into a Vietnamese wedding reception in Cabramatta Sydney, New South Wales armed with a handgun and opened fire wounding seven people. 16 July 2001 – Peter James Knight an anti abortion activist walked into an abortion clinic in East Melbourne armed with a rifle and shot dead a security guard Stephen Gordon Rogers, he was later overpowered by staff in the abortion clinic and was later arrested. He was later charged and convicted of murder and was sentenced to life in prison. 18 June 2007 – Melbourne CBD shooting – Christopher Wayne Hudson opened fire on three people, killing one and seriously wounding two others who intervened when Hudson was assaulting his girlfriend at a busy Melbourne intersection during the morning peak. He gave himself up to police in Wallan, Victoria on 20 June. 10 April 2010 – Rajesh Osborne shot and killed his three children, 12 year-old Asia, 10-year-old Jarius and 7-year-old Grace before killing himself in Roxburgh, Victoria. 30 May 2005 – Toowoomba triple murder – the bodies of three men, two aged 17 and one aged 30, were found in a house in Toowoomba, Queensland; the three men were beaten to death with metal bars and a hammer and are beaten beyond recognition, with dental records being needed to identify the victims. The murders were committed by three male youths, two aged 16 and one aged 17. One of the 16-year-olds and the 17-year-old are charged with three counts of murder while the other 16-year-old is charged with one count of murder. 23 March 2004 – John Sharpe murdered his pregnant wife, two-year-old daughter and unborn son with a speargun at Mornington, Victoria. 30 June 2008 – Cowra murders – John Walsh used an axe to murder his wife his grandson aged 7 and his granddaughter aged 5 and then used the axe to attack and try and murder his daughter who is a police officer after she arrived home from work at the house in the town of Cowra, New South Wales. His daughter survived the attack and he is later arrested and is charged with three counts of murder and one count of attempted murder and he is later sentenced to life in prison. Despite these horrific anecdotes, statistically Australia is no more dangerous than most European countries. The homicide rate is 1.1 per 100,000 and the gun violence death rate is 0.86 per 100,000. These are good numbers–the US homicide rate is 4.7 and its gun violence death rate is 10.64. You are almost 5 times more likely to be murdered in the US than in Australia and more than 12 times more likely to be killed with a gun. What are your sources for this information? The inequality and mental illness data is from the Equality Trust, the guns per capita data is from the Small Arms Survey, the violence & homicide stats are from the World Health Organization and the UN Office on Drugs and Crime. Hey Benjamin, I think this is a really well written piece! I’m just curious why on the data you excluded the Nordic countries? This topic interests me and in researching it for a post on my own blog I was pretty shocked that the U.S. wasn’t actually the country with the most mass shooting fatalities in the developed world per 100,000, which seems to be a large part of the debate. Anyways, great piece, I’m looking forward to reading more of your stuff!